This a guest post by Jean Laherrère, a long time guest contributor to TheOilDrum. The previous ultimate estimate in 2008 was 100 Gb, missing the third cycle in subsalt plays. 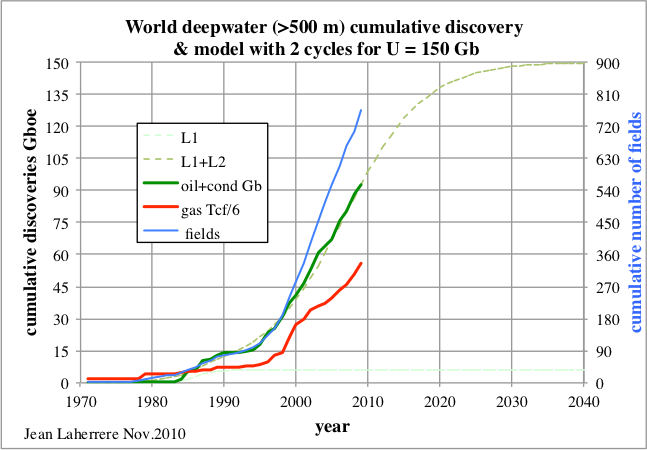 The cumulative discovery versus time with the data up to October of 2010 implied that most discoveries would be made before 2025. 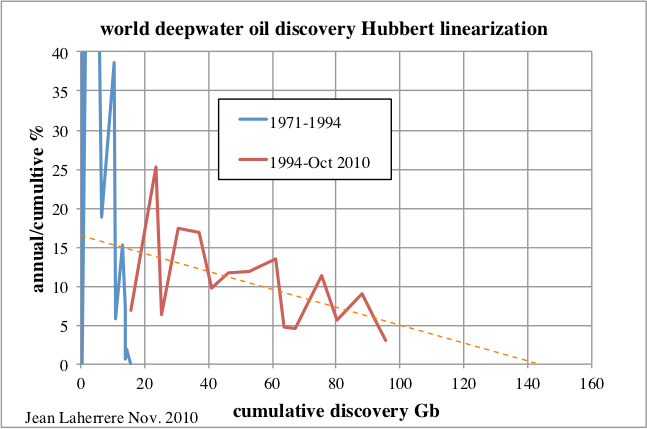 Applying the Hubbert linearisation method to oil discovery confirmed an ulitmate of about 150 Gb. The average oil field size has been around 100 Mb the last 20 years and a little less for gas in Mboe. At the same time there is a sharp change in the number of fields since 1995: it was less than 10 before that date and has been over 50 since! 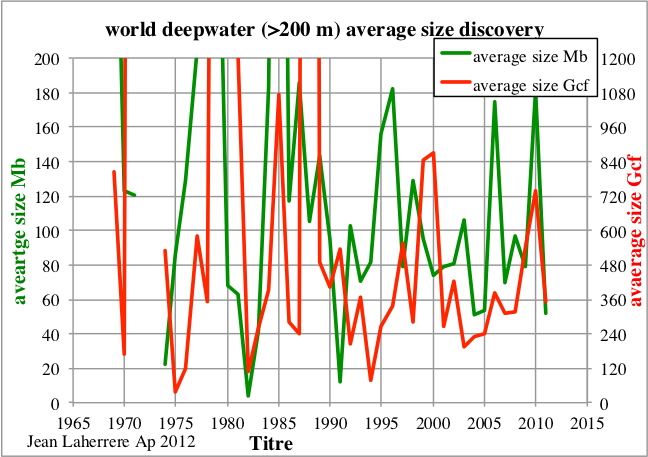 The plot of cumulative discovery versus field elevation shows that the break for water depth is more about 200 m rather than 500 m.
An update of this forecast was made with the data available up to October of 2011, this time with deepwater defined as the resource lying under 200 m of water or more. 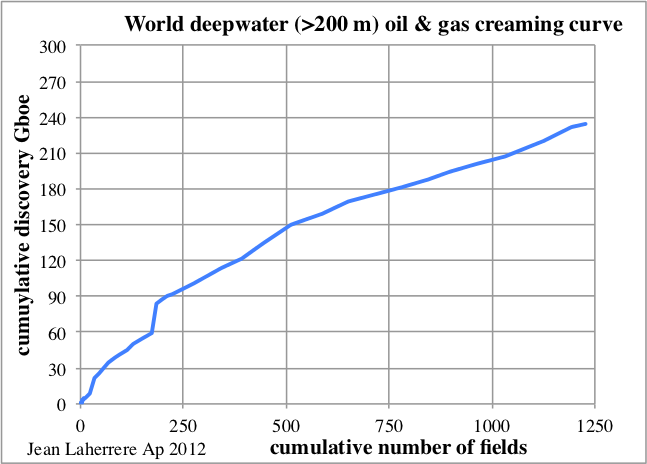 The IHS claims that deepwater is for depths over 400 m, but the database indicates that in the terrain deepwater is for over 200 m deep. 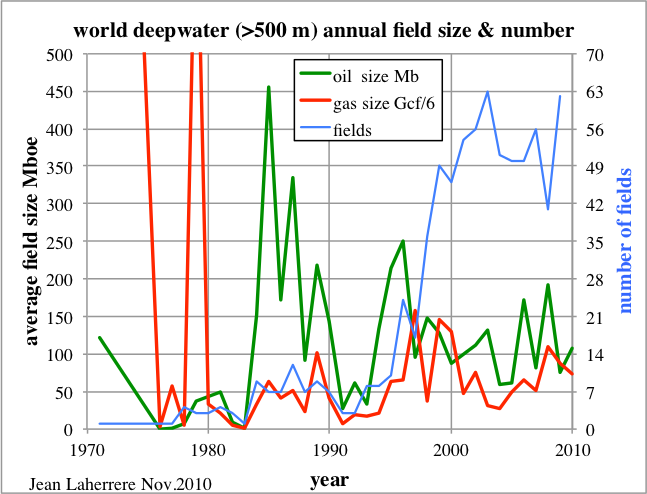 In the US Gulf of Mexico the deepwater royalty relief act of 1995 refers to depths over 200 m (656 ft), but the MMS (now BOEMRE) reports depths from 1000 ft onwards. 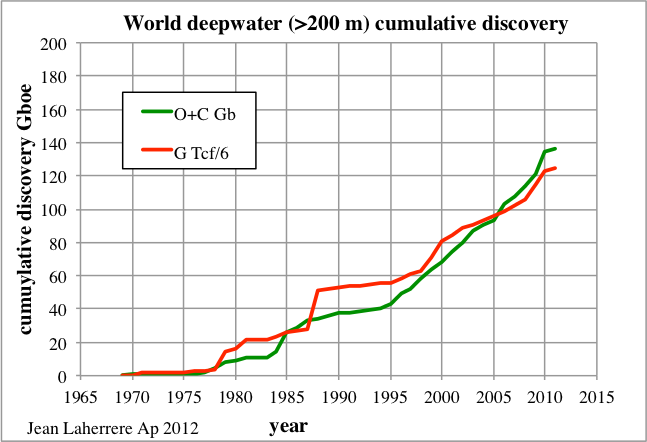 There is little consensus on the definition of deepwater, just as for ultra deep. 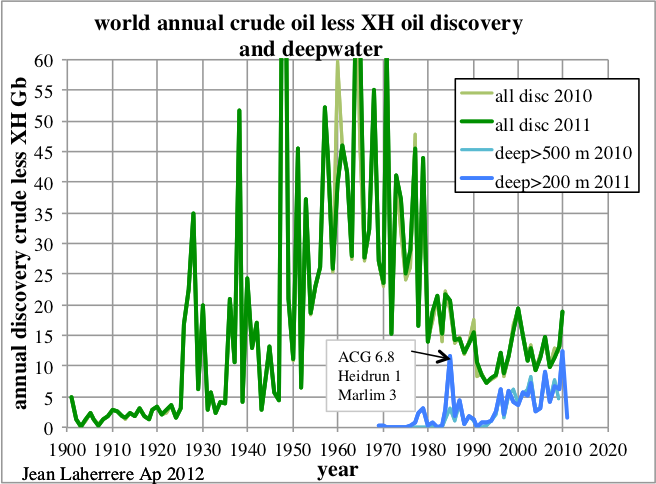 The annual crude less extra heavy oil discovery is shown here since 1900, with both definitions of deepwater (>200 m and >500 m). The same data, now plotted as cumulative discovery. 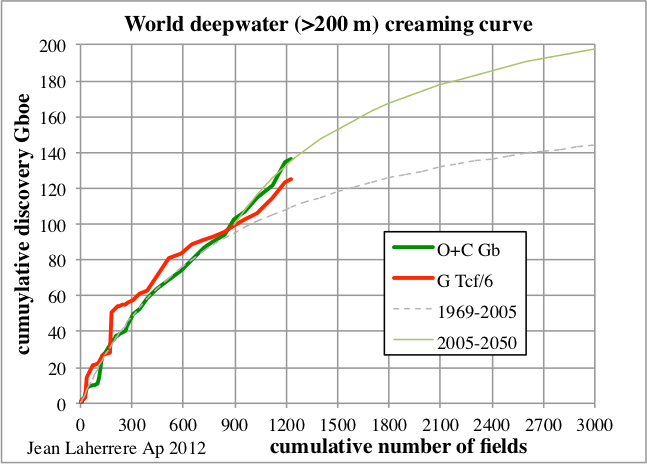 The creaming curve for world deepwater oil, this time defined as over 200 m deep, is here extrapolated with two cycles towards 200 Gb, meaning about 50 Gb for the water column interval 200-500 m. There is enough uncertainty to allow a third cycle, with a possible increase in the ultimate, but another new subsalt play is needed! 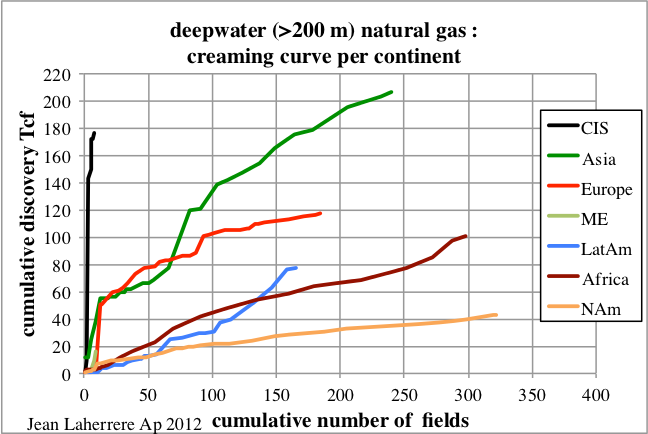 Combining oil and gas yields a simpler creaming curve, except for the last 200 fields. The cumulative discovery versus time plot displays a sharp increase in the last 15 years, cause by the subsalt plays. 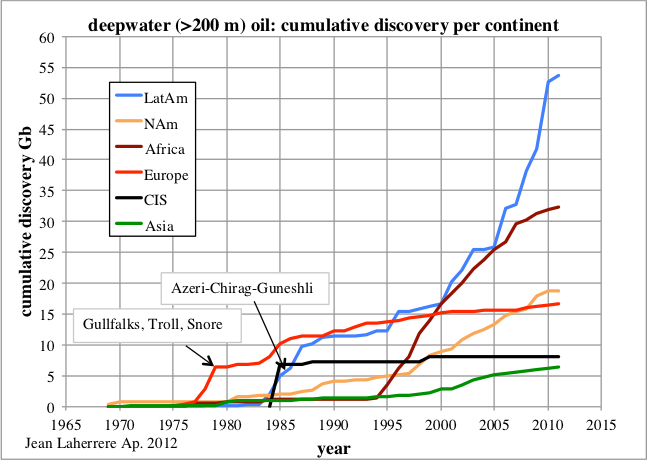 The plot for oil discovery per continent shows that Latin America has the sharpest increase due to Brasil. In the past there were jumps in the North Sea with Gullfalks, Troll and Snore in 1978 and in the Caspian with Azeri-Chirag-Guneshli in 1985. 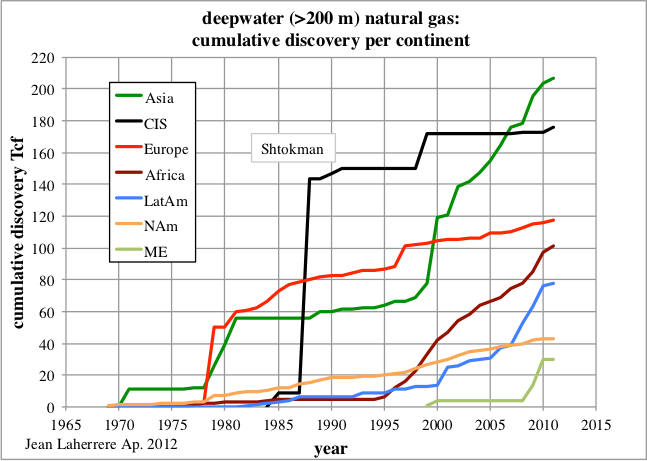 The plot for gas discoveries per continent shows the large jump in 1988 with Shtokman and the recent increase in Asia since 2000. 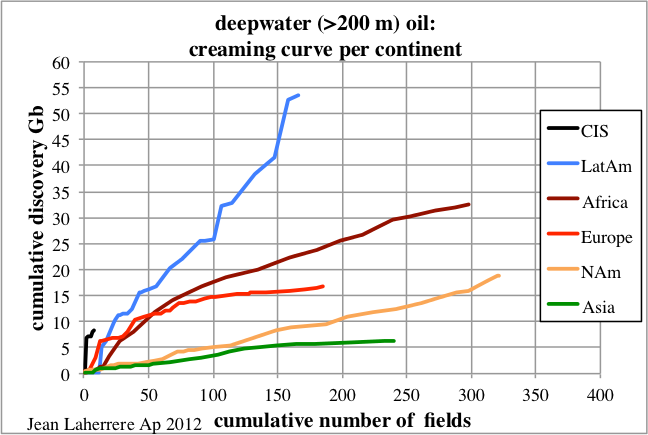 The creaming curve for oil per continent shows that Brasil with the subsalt discoveries has the largest increase and that North America still has some potential, though the average size here is quite less than in Brasil. 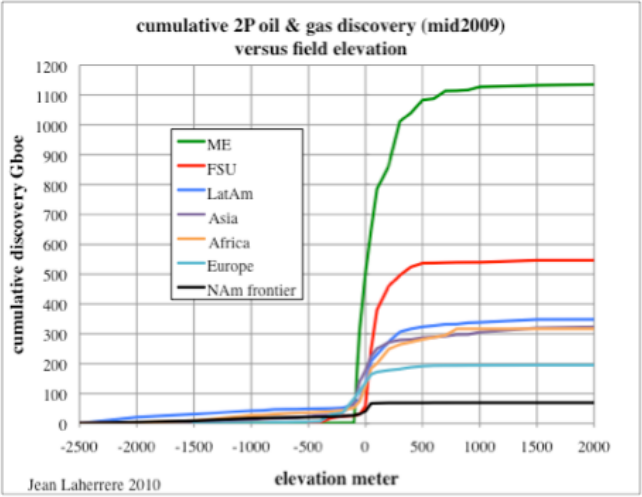 The creaming curve for gas shows that the best result is for the CIS (Former Soviet Union) with the Barentz and Caspian 9 discoveries. In second comes Asia and the least efficient is North America. The Middle East, with 20 Tcf, mainly from Israel, is at a good start. 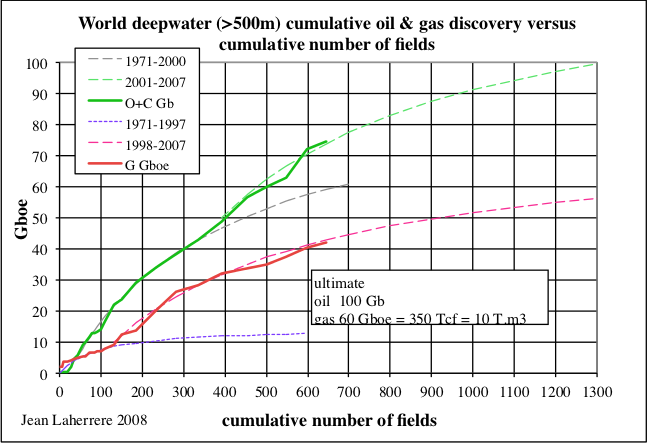 The average field size is about 100 Mb for oil and 400 Gcf for gas. 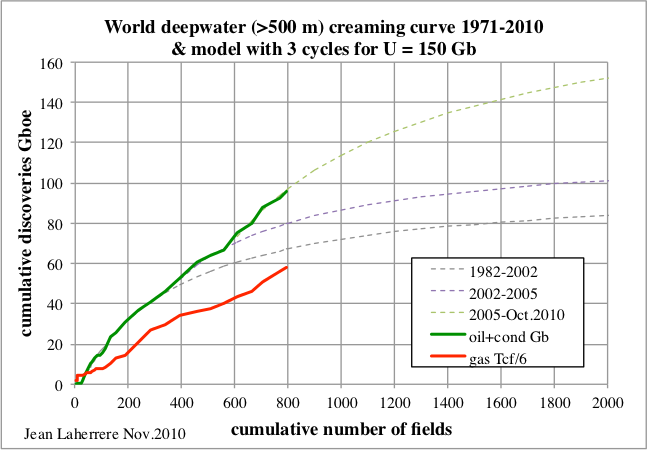 Subsalt discoveries are now well taken into account in the deepwater oil ultimate and have increased it by around 50 Gb since 2008. 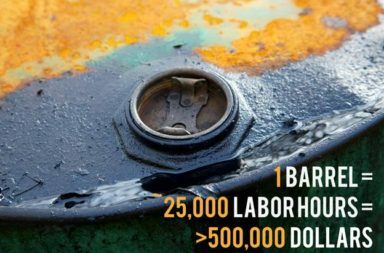 It is a significant increase, but very small compared to the uncertainty of the past world oil discovery, with the 300 Gb of speculative resources (confirmed by Sadad Al-Huseini) in OPEC reserves and with the 150 Gb correction from ABC1 reserves (used in scout databases) to 2P reserves. For more than 10 years I corrected the ABC1 reserves data for the FSU by 30 % to reduce them to 2P. This is based on the comparison of ABC1 field data with ultimates obtained from oil decline profiles in some Russian fields. 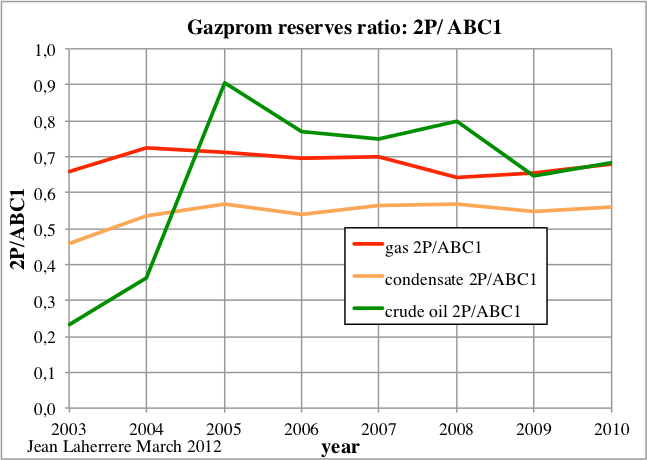 Now Gazprom publishes in their annual report both the ABC1 and 2P reserves, the latter from audits, showing that this 30% correction of is correct for oil and gas (ratio 2P/ABC1 = 70 %); nevertheless this figure seems higher for condensate. Furthermore, I have some doubt on the reliability of some deepwater oil reserves figures. My paper entitled “Deepwater GOM reserves versus production” (part I, part II and part III) shows that the oil estimate of deepwater fields reserves seem optimistic for the Gulf of Mexico, in particular Thunder Horse. The Brasilian subsalt reservoirs are complex and there is little historical production, with only a pilot project online since October of 2010 in Tupi, now called Lula (already with 14 wells drilled) with 6 Gb of 2P reserves. The BG Group, which holds a 25% stake at Lula, has reported on the first production test with a FPSO, three producing wells and one gas injector. While it was expected to reach maximum production at 100 000 b/d, it actually peaked at 70 000 b/d in December of 2011, and has registered a decline of 5 000 b/d in the following two months. 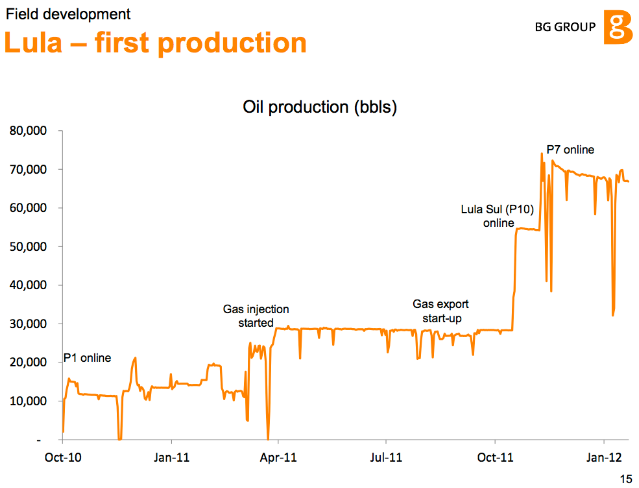 In its 2012 annual report the BG Group forecasts gross production capacity in this play to reach 2.3 Mboe/d in 2017, with a total of 13 FPSO in the Lula, Cernambi (formerly Iracema) and Guara fields. 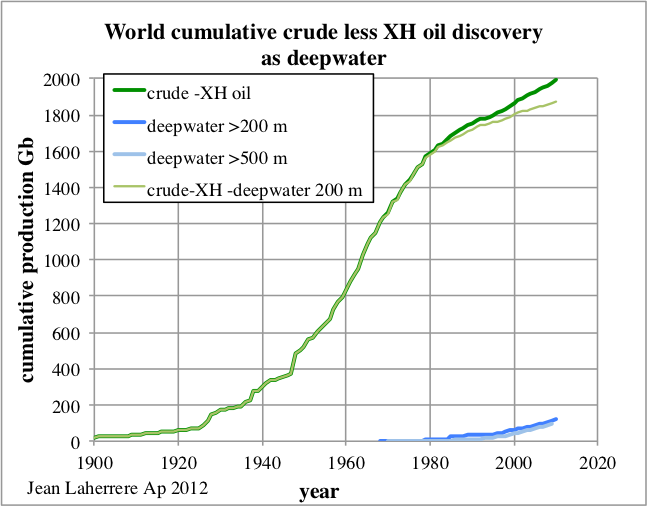 Deepwater oil production will help reduce the decline in world oil production from aging fields. The IEA claims that four Saudi Arabias need to be discovered up to 2030 to replace the present decline in production (about 5 %/a). 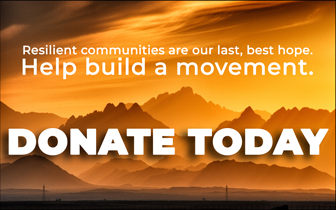 The deepwater ultimate is likely to represent less than half of Saudi Arabia’s oil ultimate. It is not enough!